She's a retired Marine fighter pilot, which means she's a total badass. She's a mom to three kids under 6, which means she can perform multiple tasks at once all while singing the theme to Elmo's World. She's running to be the first woman to represent her district in Kentucky, which means she is committed to making real change happen in Congress. 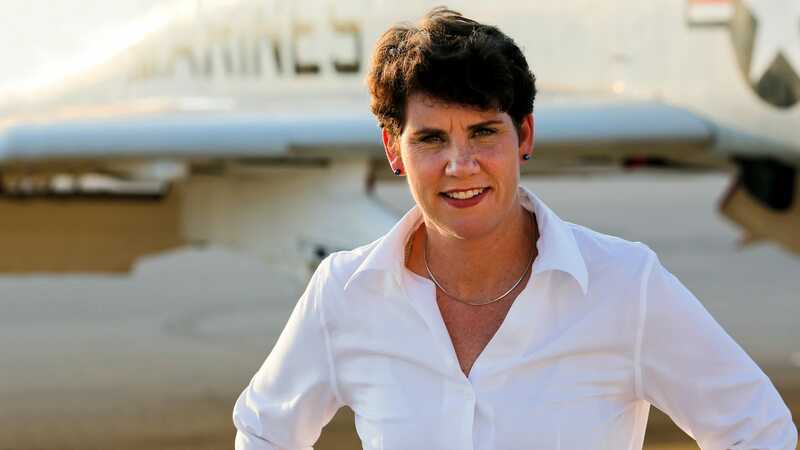 Meet Amy McGrath, the first woman marine to fly an F/A-18 Hornet in combat and now one of the record number of women who are running for office in the 2018 midterm elections. "I don't want to be there just to fill a seat. I want to make a difference," McGrath tells MAKERS. "We have all of these former military women running for Congress [because] we see what's happening in our government. We're basically saying I fought for my country and I am a woman and I'm not going to stand for that." McGrath takes nothing lying down. When she was a young girl, she was shocked to learn that she couldn't pursue her dream of flying for the military because, at the time, there was a federal law that banned women from engaging in combat. Taking matters into her own hands, she started a letter-writing campaign to every member of Congress. One congressman replied and said that women don't have a place on the front lines of war. But Rep. Pat Schroeder of Colorado believed in McGrath. "The object of a war is to win. We should, therefore, field the best-qualified military possible," Schroeder wrote to McGrath. "I think that it is time for military service to be based on qualifications, not gender." The law was repealed in 1993. And 200 flight hours and 89 flight missions later—including campaigns against the Taliban and Al-Qaeda—McGrath proved that Congress was dead wrong about women. "The Marine Corps was the toughest thing a woman could do in the military. And that is exactly what I wanted," McGrath says. "I remember going into Afghanistan and looking out at the men who were working and having them look at me—the wonder in their eyes. They had never seen a woman who was treated with the same type of respect as all the other Marines, a woman as an equal ... That's showing people American values. That's changing minds." Today McGrath's new mission is to land a seat in Congress, running against three men for the 6th congressional district seat in her home state of Kentucky which holds its primary elections on May 22. "What people ought to know, is that it's members of Congress—it's people, it's women in governments—that can make these changes. And this is why we need more women in government," McGrath told MAKERS. "The culture does not change until women rise in the ranks, whether it's in the military or whether it's in a company, into positions where they are respected peers or in the positions of power." Learn more about McGrath's campaign here.